With all the evidence now pointing to the fact that less than one per cent of the population has been getting rich at our expense, it seems this powerful minority has become very restive. Though now exposed, the privileged little group isn’t likely to stop privatising public rents without a fight: So, what if private rent-seeking is a perversion of justice? Haven’t tax systems increasingly freed up the private capture of rent since the 1970s, and didn’t ‘economic rationalism‘ and the Washington Consensus give it its blessing? Wasn’t business told to “Go for it!”? THE AGE today mentioned that freedom of information intelligence shows that Treasury correctly foresaw and warned that vested interests would be self-justificatory and insistent in seeking to avoid the mining resource rent. Subsequently, in counter attack mode, mining magnates are said to looking for an avenue of Constitutional appeal, have accused Treasury of being on a witch hunt and won opposition leader Tony Abbott’s ear in trying to defeat the rightful claim of Australians to their mineral rents. Ken Henry’s tax review panel had obviously no longer been able to ignore the sheer extent of land and resource rents the one per cent had been able to claim unto itself. They rightly concluded that resource rents belong equally to all Australians. Ken Henry’s taxation review panel made an excellent job of the task the Rudd government had set for it. Too excellent, maybe? Rudd was embarrassed, immediately disavowing the federal land tax component and putting many other recommendations on the back-burner. To his credit, then Prime Minister Rudd did take the mining tax on board, but he took it on without clearly demonstrating to the public that he was collecting what was, in fact, their rightful inheritance. Many have since come to understand the fact, but unfortunately after new Prime Minister Gillard substantially decreased the mining tax from its originally proposed 40% of net profit. We do, indeed, need to redirect the emphasis of the tax system from labour and capital back onto publicly-created incomes from land and other natural resources. 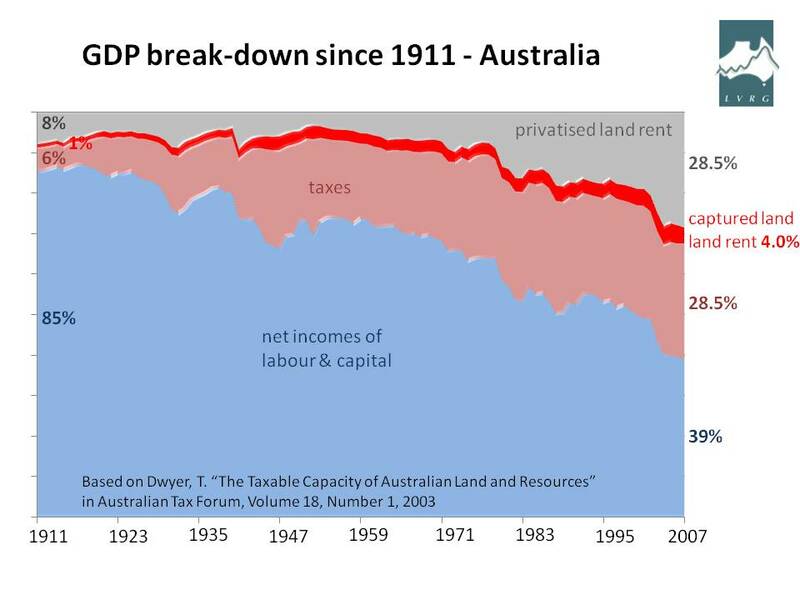 Even some of the big boys now accept the damage the tax system has been wreaking, and that Australia does need such a revenue switch if we are to free up labour and capital and avoid the repercussions of the Global Financial Collapse. To ignore the privatisation of rent, as the privileged one per cent requires, will cast Australia into the same mould as the US, Greece, Spain, Portugal, Ireland and Italy. That is, when our property market collapses we will also be expected to start bailing out our banks with a view to ensuing that the less than one per cent retains its special privileges and that the tax system is permitted to continue to disembowel the economy, putting many Australians into unemployment. Just look at the zombie economy of Japan I tried to warn in 1987 if you want to know to what point bailing out banks and supremacist property investors will take us.